Embody and learn to teach energetic alignment as the basis of energetic practice. Explore dynamic breathwork for energetic activation and as a tool for creating flow. Energise your practice, bring fluidity and flow into your yoga. Learn to create and sustain a state of flow in each phase of class from the the opening to savasana. Learn to offer dynamic hands on assists in the flow. 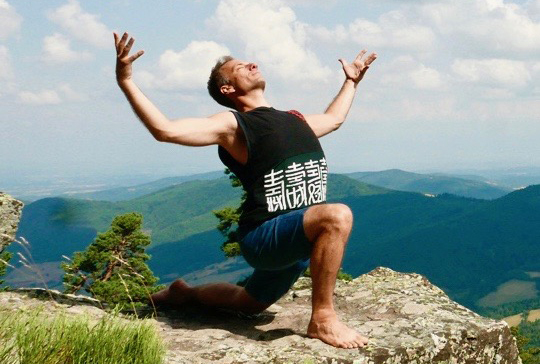 During this module, Simon shares his in-depth knowledge and love of energetic yoga, inspired by the life-changing teachings of Sri Krishnamacharya, Prana Vinyasa and the ancient wisdom of energetic practice. Experience the transformative power of this beautiful and graceful yoga that harmonizes body, breath and mind to cultivate a state of radiant aliveness and balanced wellbeing. Guide your students into a vibrant yoga practice, moving deeper into asanas while riding the wave of the breath. - Receive practical tools and templates for teaching flow classes. - Learn to support the flow of Prana, your life-energy, during the 5 phases of a class. - Learn how to embody the ‘Vayus’, the 5 winds of Prana, the energy lines and the key actions of asanas to embody and cue energetic alignment. - Study and master the inner practice, accessing the deep core and central axis of the body through fluid activation of the bandhas, the inner energy locks. - Explore dynamic breath work exercises as tools for liberating energy and bringing flow into a static yoga practice. - Energize and deepen your asanas by applying the inner practice of the energetic breath. - Receive tools for liberating the fluid body, de-armouring and unblocking stuck energy.Learn how to cue students, demonstrate and give dynamic hands on assists within the flow of a class. - Practice enhancing the flow of your class by finding the right language and use of voice. - Learn to work with music to activate, modulate and support the flow and deepen the meditative experience. Want to know more about Simon Rowe? CLICK HERE> for his resume. Would you like to sign in with a 10% discount for two modules of Daphne and/or Simon (100hr)? Note: Both modules need to be attented within six months. Please send an email to administratie@denieuweyogaschool.nl and let us know which modules you like to attend so we can send you the invoice directly. Students who attend all training hours of the module will be awarded a certificate of attendance. Thi certification option will not be suitable for students working to 300 hour or 500 hour Yoga Alliance certification. Students who wish to qualify for full 50 hour certification are required to complete and deliver a project as specified by the teacher. This will be either a video or written project depending on the module. After delivering the project, students will be invited to have an evaluation either live or by video conference. This will be in a group or personal meeting depending what the teacher decides. Final certification will be agreed during the evaluation. This advanced study (50hr) is one of 6 Vinyasa expert modules offered by Simon and Daphne (Pranalovers) in De Nieuwe Yogaschool. These Advanced Studies are open to all and can be done as separate modules. As soon as we have received your payment, your place in the training is definitively reserved. Please read our terms of agreement to make sure you are aware of all the details concerning your transaction? If you have any questions, please send an e-mail to teachertraining@denieuweyogaschool.nl. Do you want to combine your Advanced studies for a 300 hr Yoga Alliance certificate? CLICK HERE> for more information. This course is in English. Price: € 525,- ex VAT / € 635,25 inc VAT.